The history of Cuban rum is as old as colonization itself, given that is a product extracted from sugar cane, which was brought to the island by Christopher Columbus on his second voyage to this continent. What followed is well known, the roots of sugar cane from the Canary Islands flourished in fertile Cuban soil, where they found an ideal microclimate to grow, primarily around indigenous villages and trading posts. There are many different stories about the origin of rum. One version says that in 1650, a rum called "rumbillon" was brewed by pirates and corsairs who worked this part of the Caribbean Sea. In Cuba, however, it is said the extermination of the island's original inhabitants coming up to the 16th century and the subsequent arrival of African slaves taken by force from their native lands, contains another part of the story. It is thought that those slaves were accustomed to drinking what they called "garapo," made from fermenting yucca and maize. Later, they began to extract sugarcane juice which, after fermentation, turned into a strong liquor. The liquid was originally obtained using rudimentary devices but later, presses were used in the sugar plantations and mills, the juice was converted into alcohol, and aguardiente was born. Desired for its clarity and pleasant odor, rum came about through a process of distillation, but it was not until the 19th century that it became a quality product. Different distilleries and brand names sprouted up across the island. Distilleries were built in Cárdenas, Santiago de Cuba, Cienfuegos and Havana. 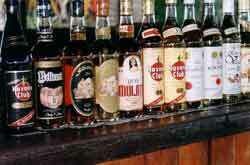 Many Cuban brands were sold abroad, including Matusalén, Jiquí, Bocoy, Campeón, Obispo, San Carlos, Albuerne, Castillo, Bacardí and Havana Club. Bacardí came to be known as the finest brand and became the largest exporter for most of the 19th and 20th centuries. One of the principal actions of the Revolutionary government that triumphed in 1959 was the nationalization of the large private enterprises. The owners of Bacardí emigrated and, although they took the brand name with them, they were unable to find plantations elsewhere that provided the unique flavor of Cuban rum, "which remained in our soil, on the plantations, in the wind, in the sun, the final syrup, the alcohol, the barrels and the inherited technological process," according to an eminent Cuban writer. Since them, the Cuban rum industry has been reorganized and expanded. Founded in Cárdenas in 1878, the Havana Club brand reemerged. Dedicated to the export market, its emblem is the Giraldilla, a statue that symbolizing the city of Havana. Tres Años Especial Reserva (Three-Year Special Reserve), Siete Años, and Quince Años (Seven and Fifteen Years, respectively), as well as the new Cuban Barrel Proof and Extra Añejo Máximo (Maximum Extra-Aged), all of which enjoy great popularity on both the international and domestic markets. For a long time Havana Club was on its own on the world market. However, other equally important Cuban brands are now gaining international appeal, including Mulata, Caney, Arecha, Legendario, Varadero, Santero and Caney.